After Intel reveals that it will use the new R&D wafer fab in Hillsboro 450mm today TSMC reveals it may make its yet-to-be-built Fab 16 compatible with 450mm production gear. Taiwan Semiconductor Manufacturing Company (TSMC) has said it remains flexible on its yet-to-be-built "Fab 16" supporting equipment used to make chips on 18-inch wafers. The foundry also indicated that it would consider constructing later phases of expansion at Fab 15 compatible with production equipment for 18-inch wafers. TSMC admitted its transition to the next wafer size will come behind schedule, as some of the tools needed are not yet ready, as well as the market's unreadiness. 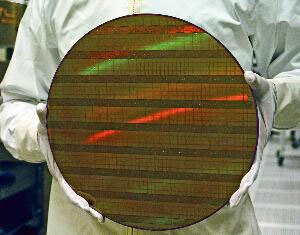 A wafer is a thin slice of semiconductor material, such as a silicon crystal, used in the fabrication of integrated circuits and other microdevices. The wafer serves as the substrate for microelectronicmicrofabrication process steps such as doping or ion implantation, etching, deposition of various materials, and photolithographic devices built in and over the wafer and undergoes many patterning. "wiki"
artworks of a next Crytek game ?